Breeze House Designs has partnered with Hydropool to become Staffordshire’s only Hydropool dealer. Leading the way in luxury thatched garden buildings, Breeze House Designs has teamed up with Hydropool to launch the UK’s first designer garden building show site. 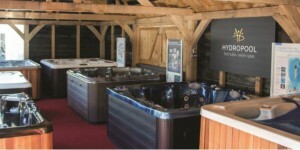 Located in Leek, Staffordshire, the show site has undergone an extensive renovation over the last 12 months and now accommodates a selection of Hydropool hot tubs and swim spas, as well featuring the largest collection of garden buildings and other high-end garden products in the North West. “We’re pleased to have teamed up with Hydropool, a trusted and well-known brand, and feel their hot tubs and swim spas add another dimension to our offering to customers,” says Andrew Peck, Managing Director of Breeze House Designs. The show site officially opened in May, when Breeze House Designs became Staffordshire’s only supplier of Hydropool products.